Data collected primarily from commercial ships between 1987 and 2010 are used to provide details of seasonal, interannual and bidecadal variability in nutrient supply and removal in the surface ocean mixed layer across the subarctic Pacific. Linear trend analyses are used to look for impacts of climate change in oceanic domains (geographic regions) representing the entire subarctic ocean. Trends are mixed and weak (generally not significant) in both winter and summer despite evidence that the upper ocean is becoming more stratified. Overall, these data suggest little change in the winter resupply of the mixed layer with nutrients over the past 23 years. The few significant trends indicate a winter increase in nitrate (~0.16 μM year−1) in the Bering Sea and in waters off the British Columbia coast, and a decline in summer phosphate (0.018 μM year−1) in the Bering. An oscillation in Bering winter nutrient maxima matches the lunar nodal cycle (18.6 years) suggesting variability in tidal mixing intensity in the Aleutian Islands affects nutrient transport. Nitrate removal from the seasonal mixed layer varies between 6 μM along the subarctic–subtropical boundary and 18 μM off the north coast of Japan, with April to September new production rates in the subarctic Pacific being estimated at 2 and 6 moles C m−2. Changes in nutrient removal in the Bering and western subarctic Pacific (WSP) suggest either the summer mixed layer is thinning with little change in new production or new production is increasing which would require an increase in iron transport to these high-nutrient low-chlorophyll (HNLC) waters. Si/N and N/P removal ratios of 2.1 and 19.7 are sufficient to push waters into Si then N limitation with sufficient iron supply. Because ~3 μM winter nitrate is transferred to reduced N pools in summer, new production calculated from seasonal nutrient drawdown should not be directly equated to export production. 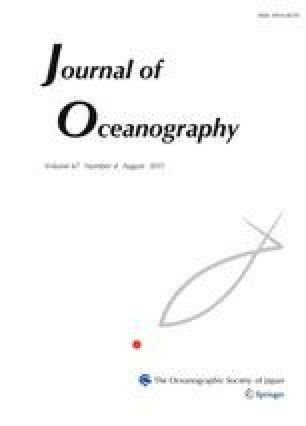 CS Wong initiated SOO sampling at the Institute of Ocean Sciences in the 1980s, a program kept running by many dedicated staff and contractors to whom I am very grateful. I am a huge fan of programs providing data on-line, thereby making results derived from them open to confirmation or re-interpretation. The time-series programs CalCOFI, A-line, HOT and Line P provided such data in the North Pacific, as does NODC for historical measurements and WOCE from their high quality surveys. Thanks also to Jennifer Putland and two anonymous reviewers who provided valuable comments on this paper.